Covington’s Sammmi Whiteman goes up for two of her 29 points against Miami East Thursday night. Miami East’s Morgan Haney scores two of her 38 points on a jumper in the lane against Covington Thursday night. Covington’s Morgan Kimmel shoots over Canence Gross as Miami East coach Bruce Vanover looks on. Maria Staton shoots a 3-pointer for Miami East Thursday night against Covington. Covington’s Laura Christian shoots from long range as Miami East’s Whitley Gross looks on. Miami East’s Whitley Gross grabs a rebound against Covington Tuesday night. It was a matchup of two teams with high hopes of making a tournament run. And two of the top players in the area in Miami East’s Morgan Haney and Covington’s Sammi Whiteman. And neither disappointed as Miami East opened a 36-19 halftime lead and held on for a 66-57 victory Thursday night at Covington High School. Haney finished the game with 38 points, hitting 13 of 19 shots from the floor and nine of 10 from the line. She scored 18 in the opening half and added 20 in the second half. 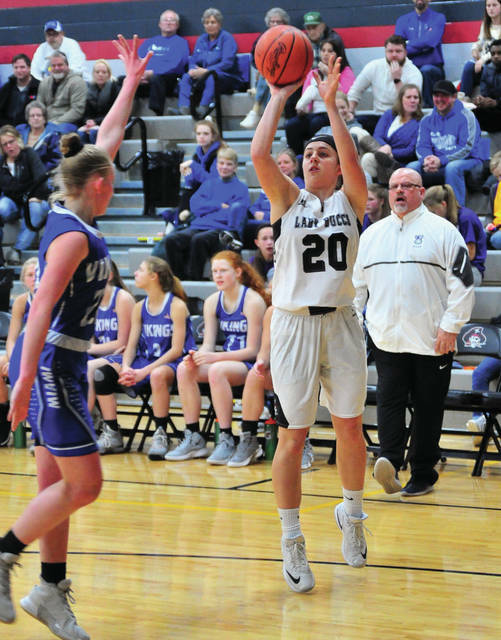 “Not bad for a girl that wasn’t feeling good all day, she told me before the game she was feeling better,” Vanover said with a smile. Whiteman countered with 29 points for Covington, including 19 in the second half. 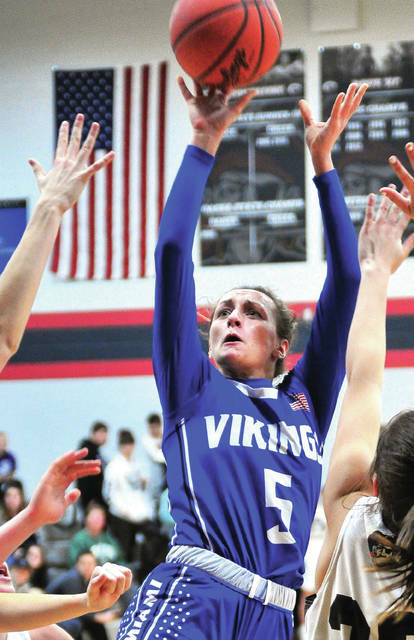 Despite the 17-point halftime lead, Vanover wasn’t feeling the game was over. And he can tell a good story. Covington opened the second half with a 3-point play by Whiteman and a three by Claudia Harrington. But Miami East countered with a three by Haney and a basket by Whitley Gross and was still up 41-25 with 4:59 left in the quarter when the game changed. 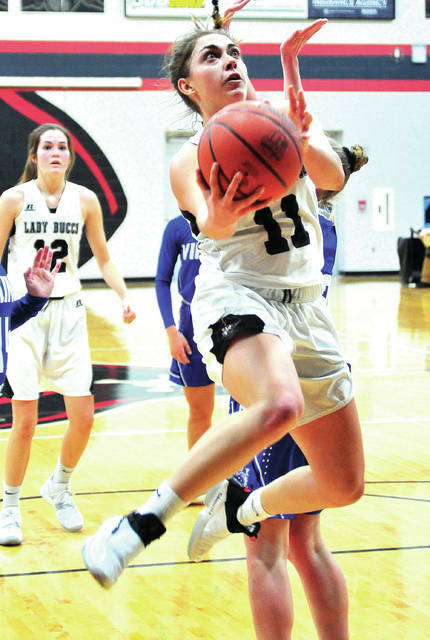 Whiteman hit a three, Harrington hit two more, Morgan Kimmel hit two free throws and Whiteman had a putback to get the Buccs within 43-38 with 1:30 to go. “We felt like we were right back where we wanted to be going to the fourth quarter,” Meyer said. 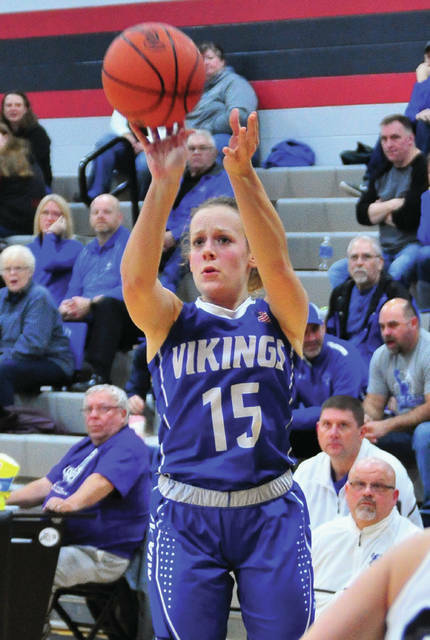 Vanover decided to stop Covington’s momentum by holding the ball for the last shot and Haney buried a three to make it 46-38 going to the fourth quarter. The other pivotal moment came midway through the fourth quarter. 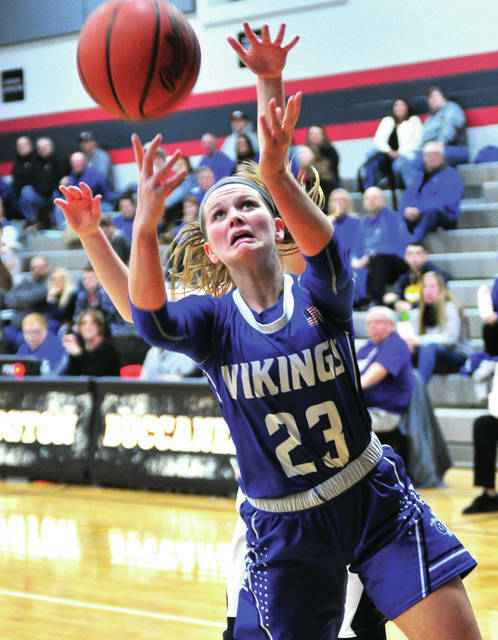 After Miami East had switched to a man defense, Camryn Miller and Haney both had four fouls and when Whiteman hit two free throws at the 4:50 mark, Covington was within 52-45. But, East responded with six points in less than a minute and Covington could not get close again. Maria Staton and Rori Hunley hit open jumpers and Haney had a steal and a layup to take the lead back to double digits. “We switched our offense and were able to get a couple really good looks there,” Vaanover said. 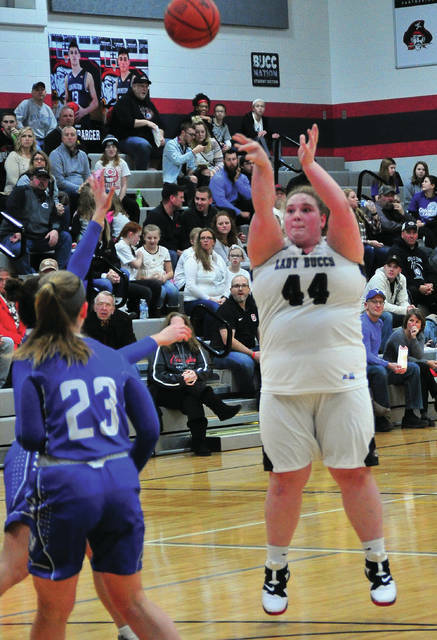 Miller added nine points for Miami East and Hunley and Staton both scored seven. Whitley Gross pulled down eight rebounds. Whiteman also grabbed eight rebounds and Harrington had 12 points and six rebounds. Lillian Hamilton grabbed 10 rebounds and Lauren Christian scored six points. Miami East was 23 of 46 from the floor for 50 percent and 15 of 19 from the line for 79 percent. Covington was 19 of 57 from the floor for 33 percent and 10 of 17 from the line for 59 percent. Covington won the battle of the boards 33-25, but had 10 turnovers to East’s seven. Miami East, 14-6 overall and 10-2 in the CCC, plays Tippecanoe Monday. Covington, 15-3 overall and 8-2 in the CCC, has a makeup game with Ansonia Monday. Morgan Haney 13-9-38, Rori Hunley 3-0-7, Camryn Miller 3-2-9, Maria Staton 3-1-7, Whitley Gross 1-1-3, Cadence Gross 0-2-2, Emily Adkins 0-0-0. Totals: 23-15-66. Morgan Lowe 1-1-3, Sammi Whiteman 10-7-29, Morgan Kimmel 1-3-5, Claudia Harrington 4-0-12, Lauren Christian 2-2-6, Lillian Hamilton 1-0-2, Makenzee Maschino 0-0-0. Totals: 19-13-57. 3-point field goals — Miami East: Haney (3), Hunley, Miller. Covington: Whiteman (2), Harrington (4). Records: Miami East 14-6 (10-2), Covington 15-3 (8-2). Reserve score: Miami East 36, Covington 30.